​Ted first came across this product with a gift bag he was presented when he was nominated for 2015 Colorado hairstylist of the year and also met their leader Toni Wells...he fell in love. There were a lot of similarities with its development and the product he was working for at that time in the fact that they were botanically based along with using cutting edge science to really adhere to the demands of unruly hair in the Colorado climate. A couple of years later while in Los Angeles Ted did a photo shoot that was sponsored by the Number 4 company and really enjoyed the creative freedom that both the products and the company offered to an editorial stylist which simply validated his love for the brand. At this shoot he found out that the line is a vegan line and has color protection and uv protection in each of their products along with a rejuvenating system that was putting them in a category all of their own. In 2016, after resigning his position with JBH, he chose to bring the brand into the salon and it was a huge hit. Since then he has embraced the N4 culture and has done some photo shoots, education, runway work and product knowledge for the brand and we are very excited to be part of the Number 4 Perfomance Hair Care family. Ted was a national hair cutting educator, Global Platform Artist and eventually the International Technical Director for J Beverly Hills at their corporate office located in Los Angeles California. 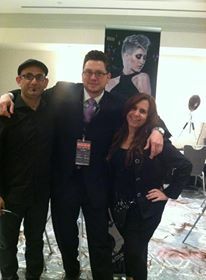 His development in the company started around 2011 and has been a fantastic opportunity for Ted to travel the world and learn the most up to date technology and fashions in the hair industry Starting as a National Hair-Cutting educator being mentored by the great Masaki himself and ending with a Directors position. This position allowed for him to create curriculum, educational programs, platform-artistic work, runway, editorial and product development on products like Smooth, pre-boost(reformulating the smell) and 5-in-1. Ted Resigned from J Beverly hills in 2016 to focus on his scissor business, salon business and family. Juan Juan (joo-wan) moved to the United States over 20 years ago with a dream to become a hair dresser. After all of his hard work and determination, he opened up his first salon in Beverly Hills, California. Juan Juan is a stylist to the stars and has become one of the most well known stylists in Beverly Hills. The need for professional products became evident for Juan. Juan became aware that there was a fine line between professional and non-professional products. His dream to create an exclusive professional product line became a reality. Keeping professional products in the salons and out of grocery and drug stores was his goal; he achieved this goal by utilizing state of the art anti-diversion technology. He was also able to control anti-diversion by manufacturing J BEVERLY HILLS products in his own plant, and not a big corporation that handles multiple product lines. Being able to own a manufacturing plant gave Juan Juan the advantage of working hand in hand with in-house chemists and cosmetologists. Juan works on a daily basis with the chemists to ensure quality products that contain organically based botanical extracts. By creating the J BEVERLY HILLS wet line, Juan Juan fulfilled his vision of bringing the Beverly Hills experience to the rest of the world. The products convey the luxury lifestyle by incorporating invigorating fresh fragrances combined with high quality ingredients. J BEVERLY HILLS Botanicals are some of the highest grade found in the beauty industry. Juan Juan and the J BEVERLY HILLS research and development team work closely on a day to day basis with in-house chemists, researching what botanicals and ingredients are most effective in creating beautiful, healthy hair. J Beverly Hills products are paraben and sulfate free. o WHAT IS PARABEN? Paraben is a chemical preservative such as methyl, propyl, butyl and ethyl paraben, which are linked to many forms of cancer due to the fact that it mimics estrogen and disrupts the endocrine system. This is a very controversial ingredient that some believe is not harmful. At J BEVERLY HILLS we believe that the use of products containing this ingredient may contribute to ailments in the long run and chose to use the safest ingredients as replacements. o WHAT IS SULFATE? Sulfates are harsh chemicals that are a known to cause eye and skin irritation. Sulfates are very drying and can damage the hair follicle which could lead to hair loss. It can also strip the hair and scalp of essential oils causing a drying effect. o WHAT ARE THE SUBSTITUTES? We replaced all forms of Paraben with Phenoxyethanol and Ethylhexylglycerin. Sulfates have many different replacements and some that we use are Sodium Lauryl Sarcosinate and Cocamidopropyl Betaine. Ted and Juan Juan,founder and creator of J Beverly Hills. Pablo Kumin, Ted Medina and Eric Bachelet. Eric is the top requested stylist in France for editorial and special occasion hair, as well as an international educator for J Beverly Hills. Pablo has been at the top of his game on editorial and runway in London, Sweden and other European cities. This was a very fun day watching these three play with different styling strategies. Waleed and Jen. Both are amazing Hair Designers and a major part of the educational team for J Beverly Hills. 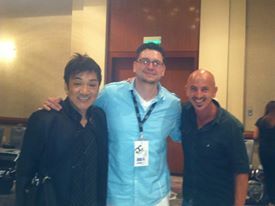 Masaki, Ted and Steffano. Masaki is the head of the international haircutting education department and has developed the trend cuts and played a primary role in developing the J Beverly Hills hair cutting strategies. Steffano is one of Italy's best, using superior hair cutting techniques. They both shared what they knew with each other this day and it was an honor to anybody in the room with so much talent from all over the world.